Newfound Gap is one of those spots in the Smokies you just have to check out. Here you'll find the Tennessee and North Carolina border. The Appalachian Trail also passes through it. While it's a busy place to be, it's also where you'll find many incredible trails to hike. July and October are the park's busiest months. I recommend visiting in May or early June. Clingmans Dome Even though it's steep and paved, I rated this hike as easy because it's so short (a whopping 1 mile round-trip)! You end up at an observation tower that gives 360º views on clear days. Sugarland Mountain If you like long, quiet hikes this one's for you. We didn't see a single person the time we hiked it. If you're going to hike the whole thing, it's best to start at the top of the mountain, at the trailhead off Clingmans Dome Road. I rated it as moderate because of the length. Alum Cave to Mount LeConte This challenging hike is an amazing adventure. The views are incredible. 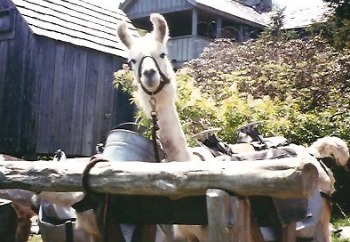 You might even come across some llamas along the way, like I did. It's 10 miles round-trip and the trailhead is located near the Chimney Tops trailhead. Andrews Bald This moderate hike has views, wildflowers, and the destination is a great place for a picnic. It's a 3.6 mile hike located off Clingmans Dome Road. Chimney Tops If you're looking for an adrenaline rush, this hike's for you. Although it's a steep climb, the amazing views at the end are worth it. I rate this as a moderate hike because it's not that long. If you start from Newfound Gap, it's a 4-mile hike. The other option is to start from the less popular, least-crowded end on Clingmans Dome Road. That makes for a 7-mile hike.